Violence In Media "WHAT CAN BE DONE?" What's your opinion about what can be done in our society to reverse the present trend of more and more violence in media? Please click on the comment link at the bottom of this entry and share your thoughts and ideas. If you have children or grand children, this is a must see 5 minute video. A child will witness over 200,000 acts of violence in mass Media before he or she turns 18. 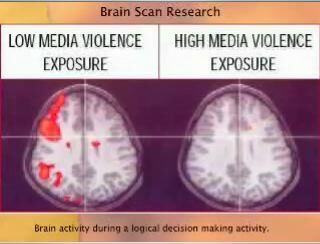 Research indicates that this same media violence has a negative impact on natural brain development. Stephanie Stracke is a ROCORI Student Councilor and a member of the Project SERV staff, a special task force brought together following the shootings at ROCORI in 2003. 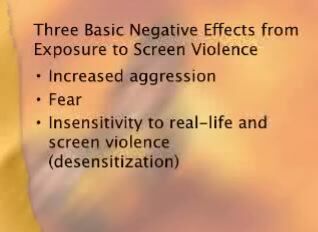 In this story Stephanie, who has her own teenagers at home, talks about how the exposure to screen violence can cause increased aggression, fear and desensitization to real life violence. Research shows that since 1982, television violence has increased 780%. During this same time teachers report an 800% increase in aggressive acts on the playground. 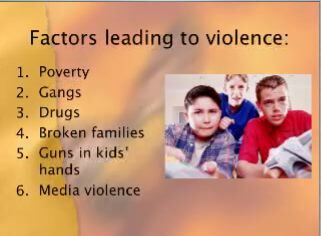 Sources of violent acts include television, video games, movies and the Internet. Todays youth spend an average of 44 hours per week in front of a screen. #1 We have rules in our family limiting how much time teens use the media. #2. We keep TVs, video games and computers out of our kids' bedrooms. #3. We keep the TV off during meals. #4 I know what the diffferent media ratings systems mean. #5 I don't allow my teenager to go to R-rated movies or play M-rated video games. #6. I talk with my teen about music lyrics that I object to. #7 We have clear rules about Internet use. #8 I monitor my teen's Internet use. * Have clear family rules about screen time. The clearer the rules, like "No TV or video games before school or until homework is done," the better. Consistency is important. * Refuse to expose children under the age of 7 to ANY violent content in entertainment. *Don't let your children play violent video games, especially ultraviolent first-person shooter video games. Check VIDEO GAME REVIEWS for reviews of video games. * Monitor your child's use of the internet. Don't let your child have unlimited access to the internet. Install Internet monitoring software and let your child know that you will pay attention to how they are using the computer.